Fresh Air. The new version of the 13-inch MacBook Air has been refreshed from top to bottom, but still has its old Core 2 Duo processor. Find out in our review whether the package as a whole is convincing and whether it is worth the high price tag. 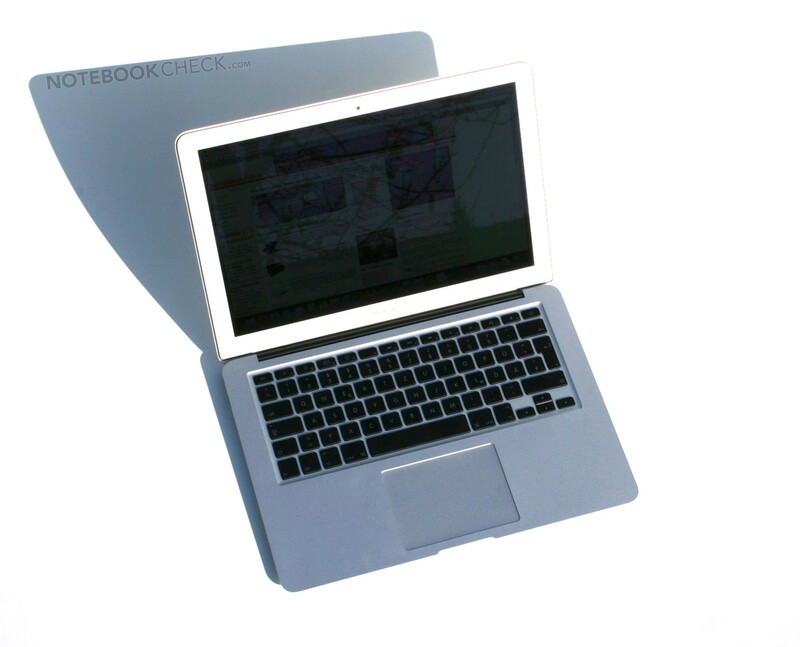 As well as the new 11.6" MacBook Air which we have already reviewed, Apple has also refreshed the 13-inch model of the thin and light subnotebook. Compared to its predecessor from over a year ago (with a design that is actually two years old) Apple has left only the processor untouched. The most important changes are the new and much faster chipset graphics card, the latest version of the unibody case, the glass trackpad, a fast SSD, and a high-resolution display. With a weight of only 1.327 kg this 13-inch model most definitely belongs to the subnotebook class. Combined with its slim profile of 0.3 - 1.7 cm, the little Mac fits easily into almost every bag. But thanks to its full-size keyboard and relatively large screen it can still stand in for a larger notebook in many situations. 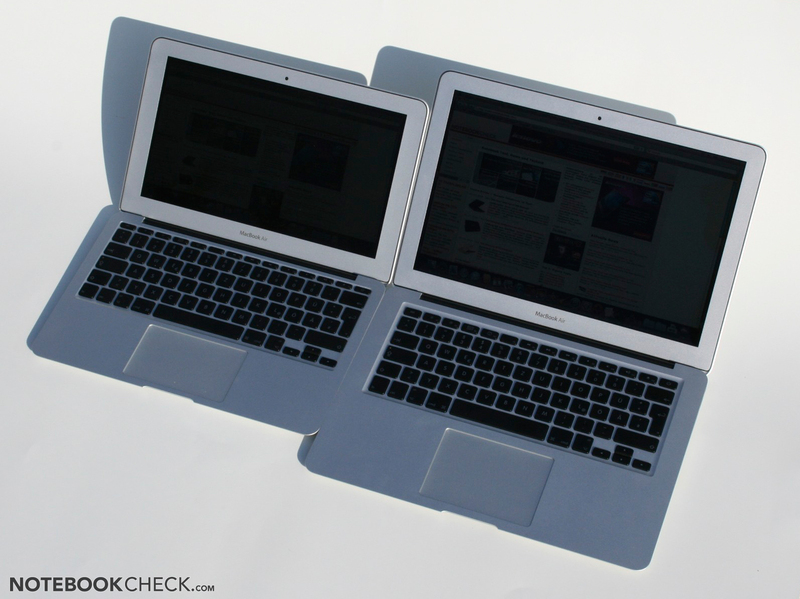 Compared to the 11-inch model, the 13-inch version has a more powerful CPU, a bigger battery and bigger screen. 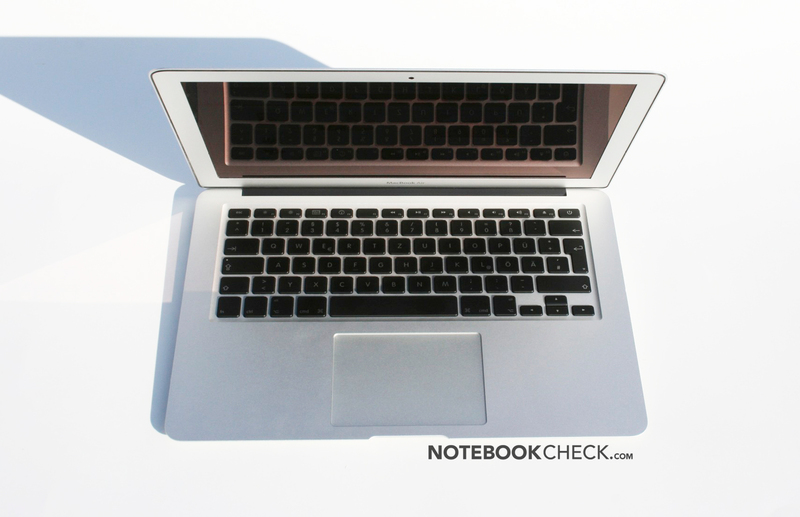 As there are many features that the two subnotebooks share, parts of this review are based on our review of the 11" MacBook Air. Our test model from Apple Austria is the MC504LL/A which currently costs €1,599 and comes with the base model 1.86 GHz CPU, 2 GB of DDR3 memory (soldered) and the larger 256 GB SSD. For €90 you can upgrade to a 2.13 GHz Core 2 Duo or opt for 4 GB of DDR3 memory, also for €90. 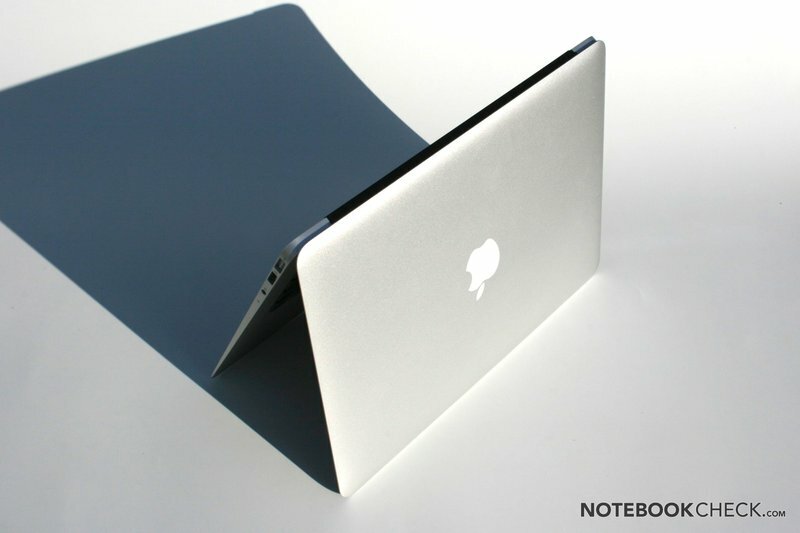 The MacBook Air’s new unibody case is quite similar to the smaller 11-inch version except of course the size. It is just as appealing thanks to its simple and timeless design and looks similarly well proportioned. Naturally, the main thing you notice about it is its thin appearance. As the notebook tapers towards the edges, from the side it looks even thinner than it is. 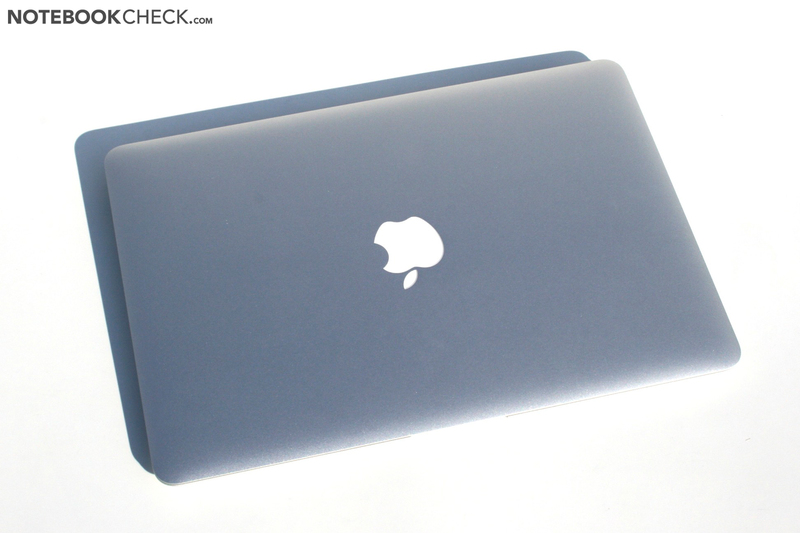 The 13-inch MacBook Air’s case is cut from a single block of aluminium, like the other aluminium MacBooks. As with the 11-inch model, the lid is now also made using this unibody process. It makes the case very robust despite its small size. However, the larger 13-inch case is a little less resistant to strong pressure than the 11-inch version (in the middle of the lid and base unit). Nevertheless, the case provides excellent protection for the notebook’s insides, particularly compared to other subnotebooks made of plastic. Apple has used a single continuous hinge, as is usual for the current unibody Macs, instead of the two small hinges you see on the old MacBook Air. This will hopefully eliminate the problem of broken hinges that some of the old MacBook Air models suffered from. The maximum opening angle is still a little too small at 130 degrees. 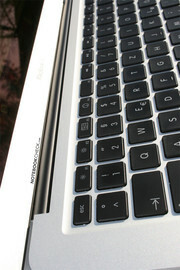 The 13-inch machine’s hinge was not as free-moving as the one on our 11-inch review model, which we noted positively. As you would expect from Apple, the feel of the materials is outstanding. The Windows competition can unfortunately still not match it in this respect. 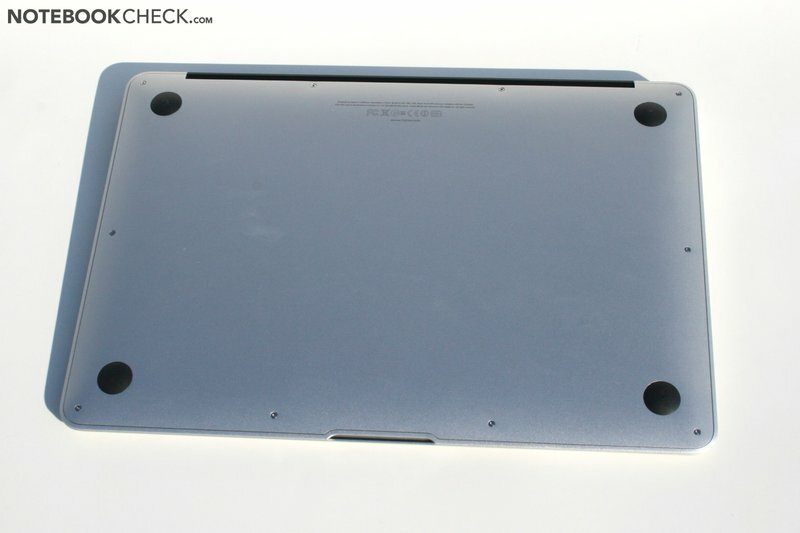 In theory the MacBook Air can simply be opened up by removing the screws on the underside and then taking off the whole of the base plate. Apple has made this exceedingly difficult, however, by using special five-point Torqx screws. If you manage to fight your way into the back of the machine despite this, it’s still only possible to replace the mSATA SSD. The memory, CPU, and GPU are all soldered onto the motherboard directly and therefore not upgradable. You can find more information about the insides of the Mac and the special Torqx screws from our colleagues at iFixit, who have dissected the similar 11-inch MacBook Air. Compared to the previous model, quite a lot has happened with the ports. They are no longer covered by a fiddly cover, and the amount has been extended significantly with the addition of a second USB and an SD card reader. Other notebooks in this class normally offer at least a LAN port and possibly an additional USB. 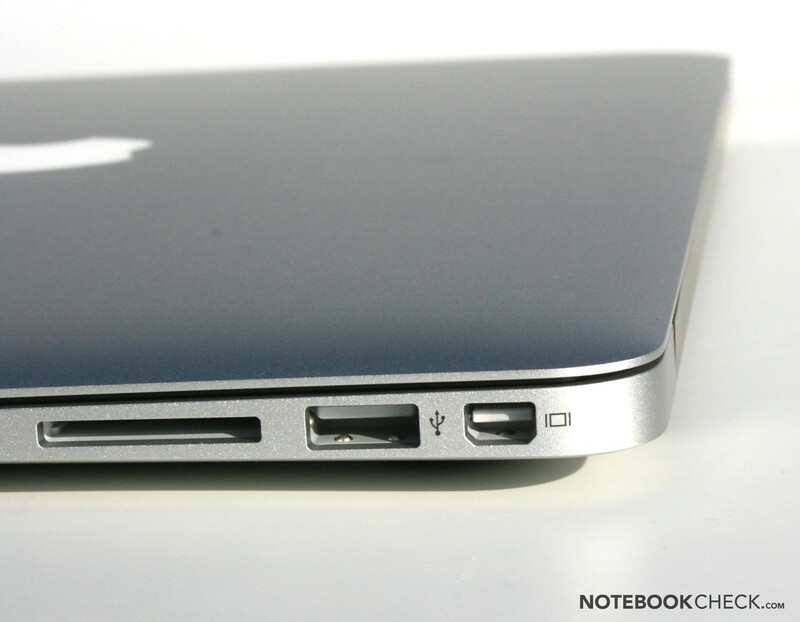 The 13-inch MacBook Air is also lacking a port for a docking station (as with all Apple Macs). The ports are found on both sides towards the back of the machine, which is a good thing. The webcam built into the lid, now called the FaceTime Camera, does not produce a particularly wonderful picture. But the quality is sufficient for video conversations and the integrated microphone worked very well when we tested it. This means you can use the MacBook Air for Skype or FaceTime without a headset if you want. As with the 11-inch MB Air, wireless connections are handled by a Broadcom BCM943224 chip with two antennas which supports dual band 802.11n and Bluetooth 3.0 (but only BT 2.1 +EDR according to Apple). The chip supports WLAN data transfer rates up to 300 MB/s and proved to be reliable and to have a good range in our test of the 11-inch model (tested with a Trendnet TEW-633GR). There is no wired Ethernet connection, but an optional USB adaptor is available (100 MBit) which was already working well in our review of the first MacBook Air. 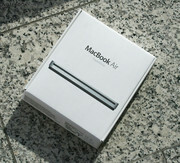 Apple offers a 12-month warranty as standard and 90 days of over-the-phone support for the MacBook Air. You also have the option of extending both of these to 3 years for a rather steep €249. 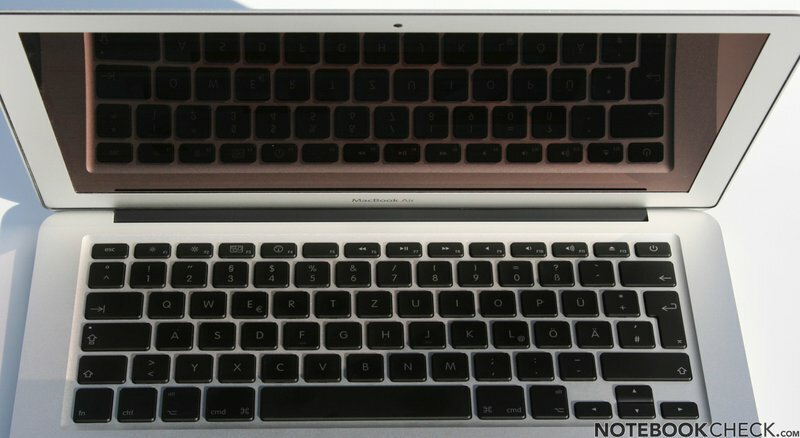 The integrated chiclet keyboard in the 13-inch MacBook Air is just like all other current Apple keyboards, with one small exception; the function key row has been shrunk a little (though not as much as on the 11" Air) and it now also houses the on/off button. 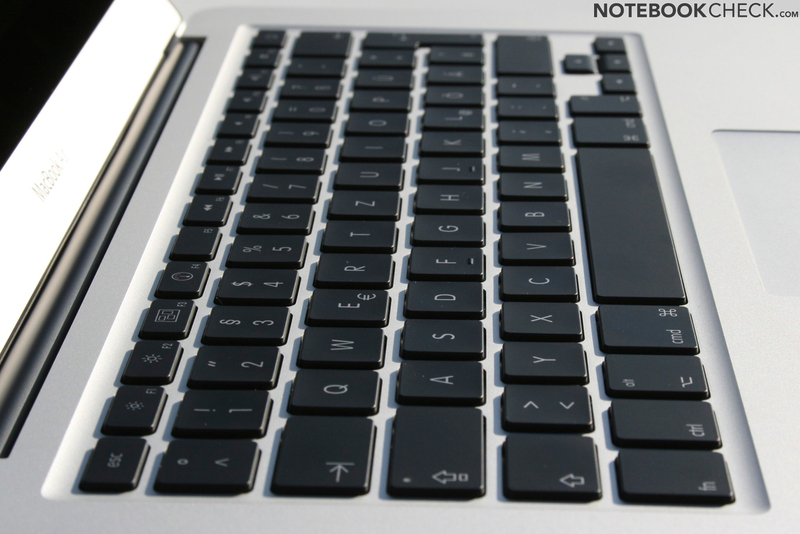 As with all the current MacBooks, the black keyboard has many excellent qualities. Despite the short stroke depth you can type on it easily without tiring. 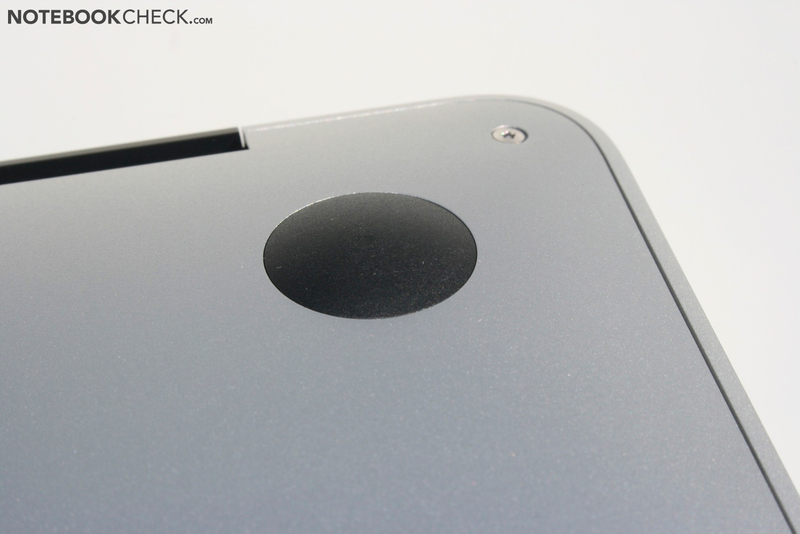 As the keys are screwed directly into the unibody case, there is no annoying flexing or clattering. It uses the usual Apple layout which will be a little unfamiliar to Windows users. Sadly the new MacBook Airs have to do without the keyboard backlighting which was so useful on the old MacBook Air and MacBook Pro models. 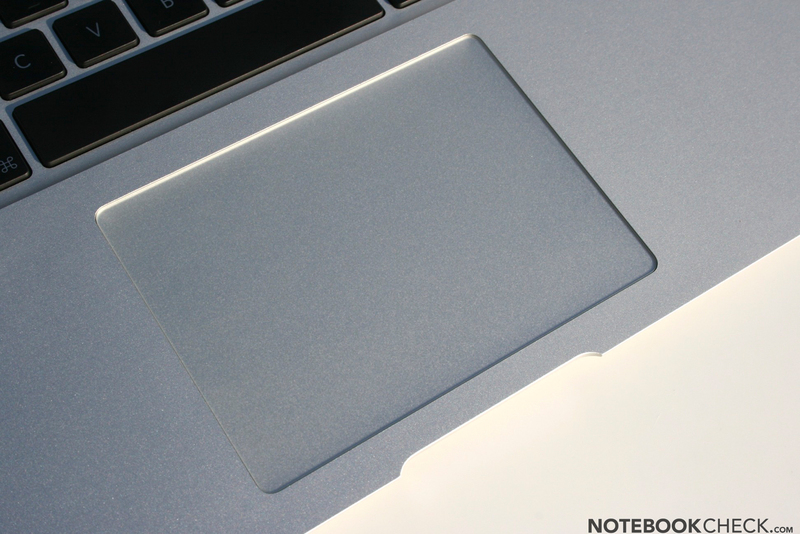 Finally, the glass trackpad has made it into the MacBook Air models. 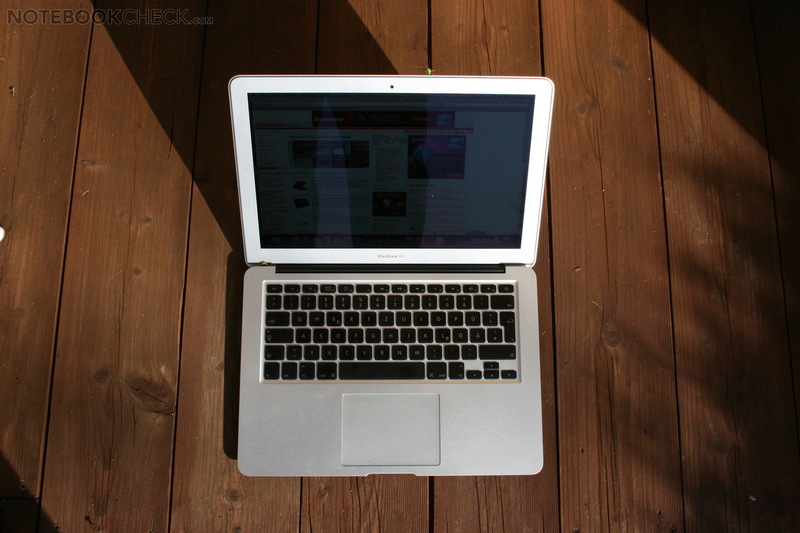 Its excellent smooth feel and huge size (for a laptop) make it enjoyable to use. 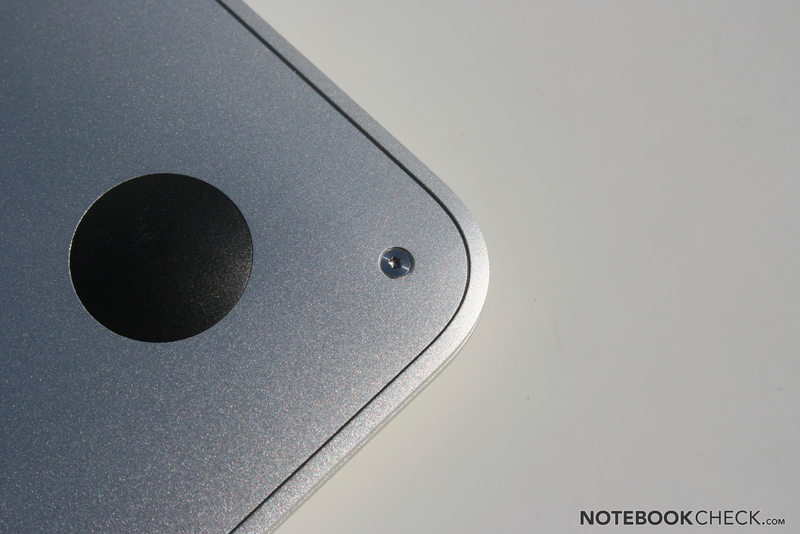 Apple touchpads don’t have dedicated buttons (any more), but, the whole pad can be tapped as a button (apart from the top edge). With the help of some clever Mac OS X software, the trackpad can also be used like a traditional touchpad with buttons. A wide range of multi-touch gestures using up to four fingers (including the very helpful inertial scrolling) allows you to make the most of the large glass area. Apple’s trackpad continues to be the best built-in touchpad for laptops and is still unrivalled (at least under Mac OS X) for precision and ease of use. Under Windows, you unfortunately have to suffer some losses, but you can still get on with it fairly well in spite of the rudimentary driver. 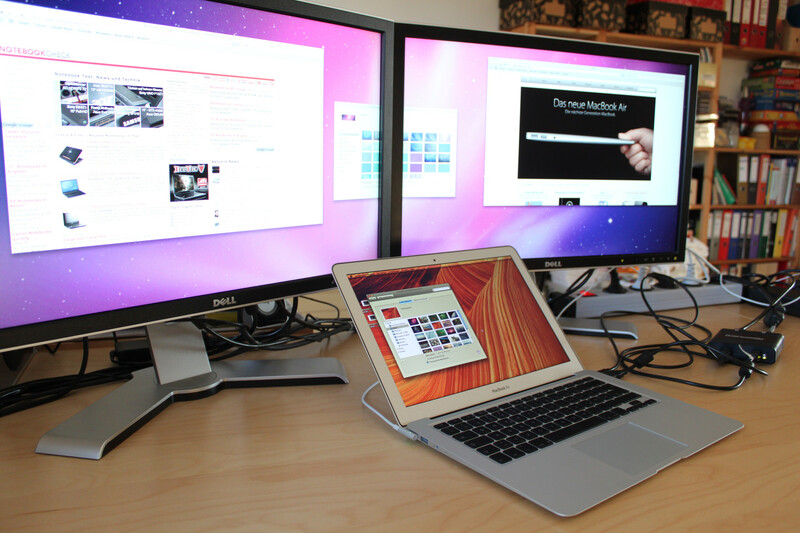 The distinct feature of the new 13" MacBook Air is the high resolution widescreen display. With 1440 x 900 pixels the Air offers the same resolution as the base 15" MBP model, and thus significantly more "room" on the desktop than the older version with 1280 x 800. 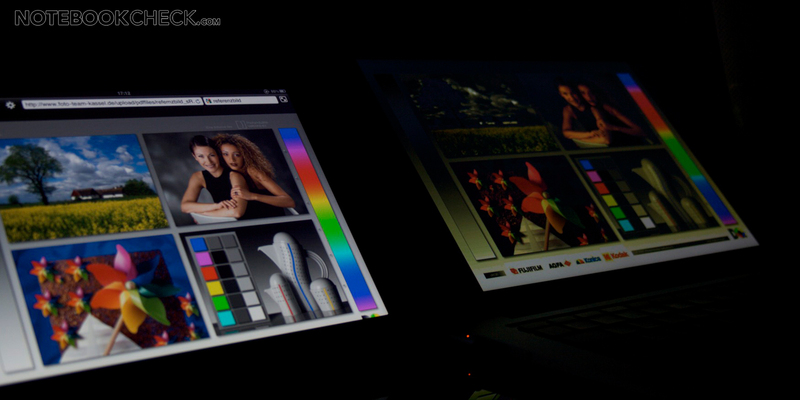 The maximum brightness and illumination are similar to the older model. With an average of 306 cd/m² the display can shine very bright, and, therefore, trump most of the reflections on the smooth surface. 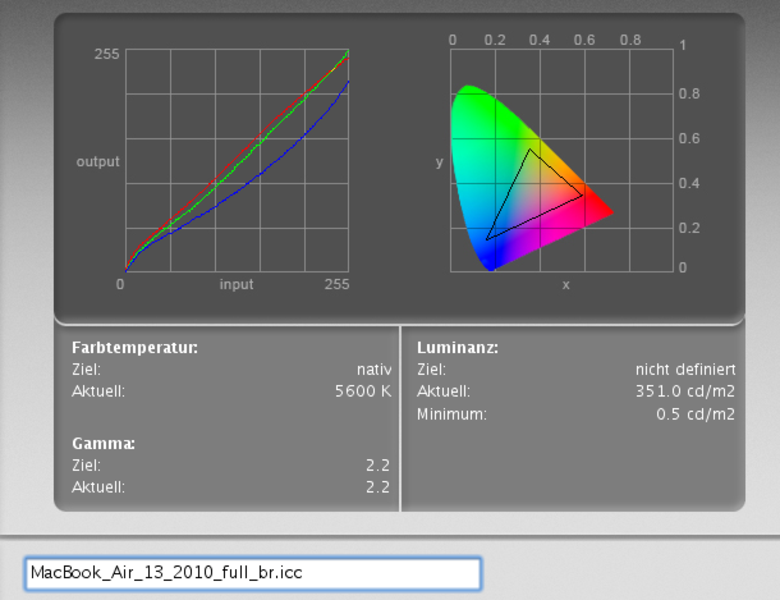 Thanks to the relatively good black level, for this level of brightness, the display reaches a maximum contrast of 640:1 (647:1 using brightness level 6 with about 97 cd/m²). The illumination is only average at 77%. Isolated areas can, however, not be recognized. 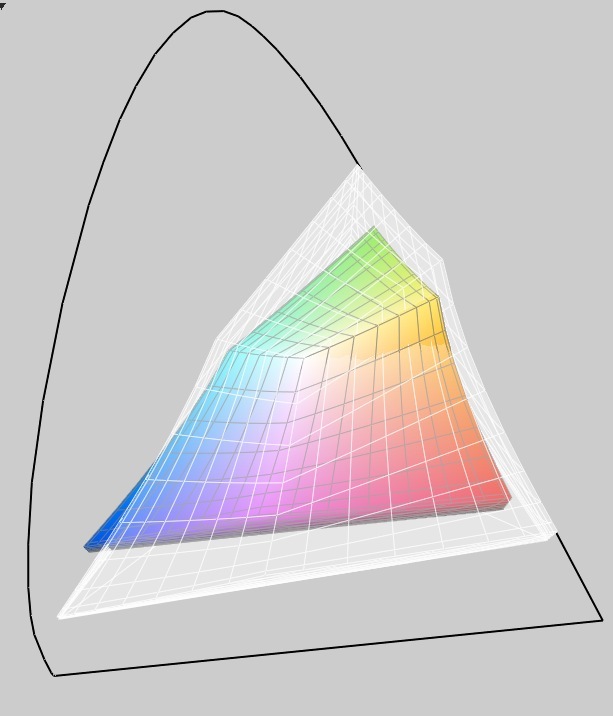 The representable color space is more or less the same as with the white MacBook from 2010, and the 11" MacBook Air. 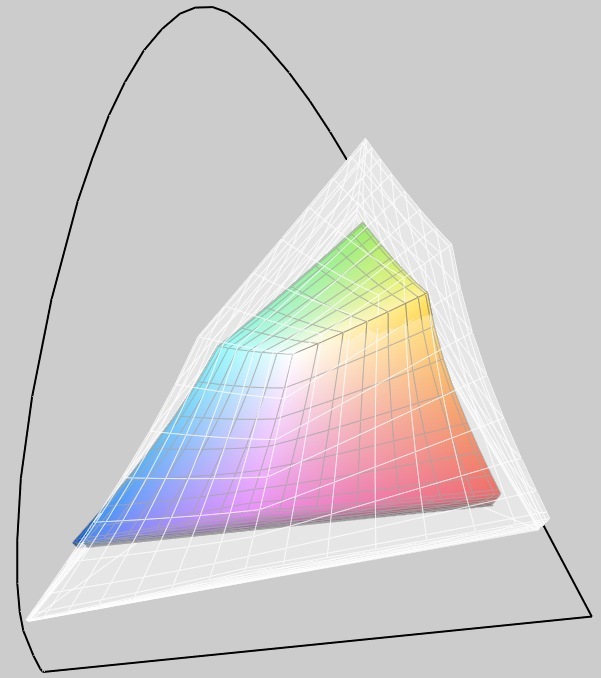 Thus it is significantly smaller than the sRGB color space, and also than the color space from the MacBook Pro models. 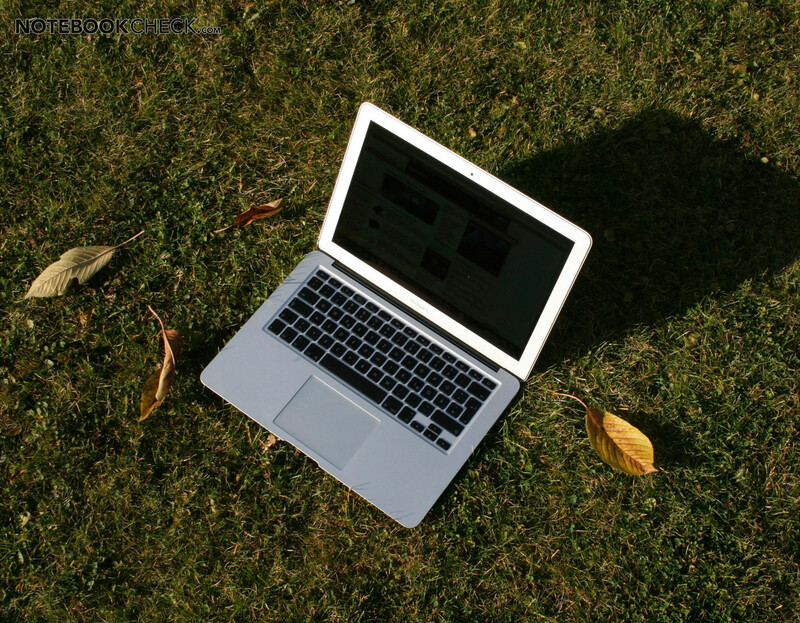 sRGB (transparent) versus MacBook Air 13"
MacBook White (transparent) versus MacBook Air 13"
MacBook Pro 17" (transparent) versus MacBook Air 13"
Thanks to the high maximum brightness, outdoor use under sunlight is also possible with the MacBook Air. 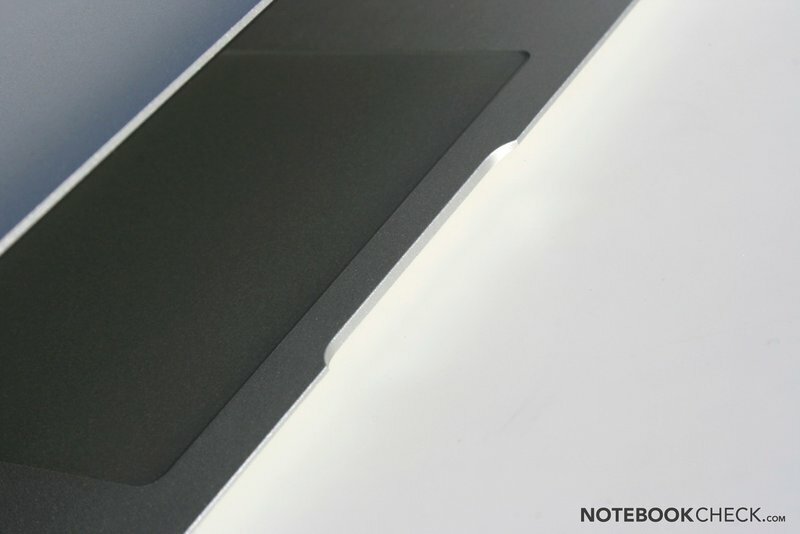 The glossy display surface does, however, lead to strong reflections. 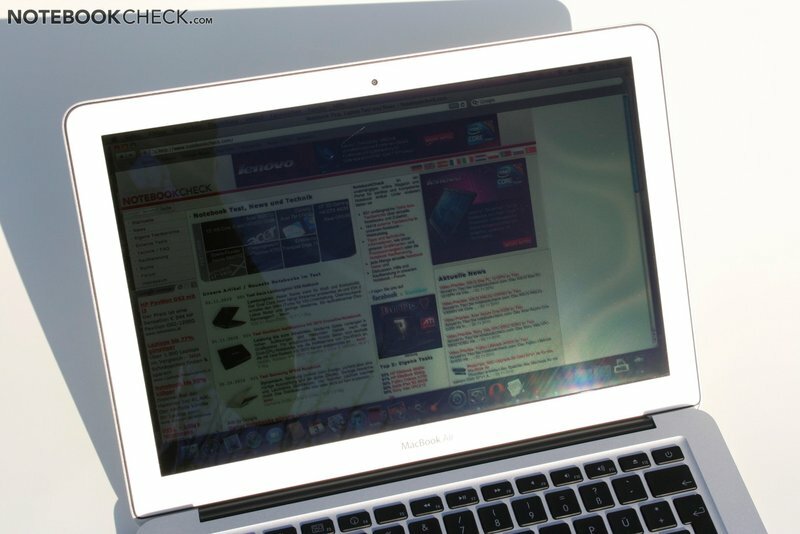 In contrast to the 11" MacBook Air, the reflections on the 13" variant have a slight red tint. Apple has again opted to use a TN panel for the new MacBook Air, which shows the typical limited viewing angles from above and below. Particularly compared to the iPad the darkening from below is very noticeable. Everything as ever? 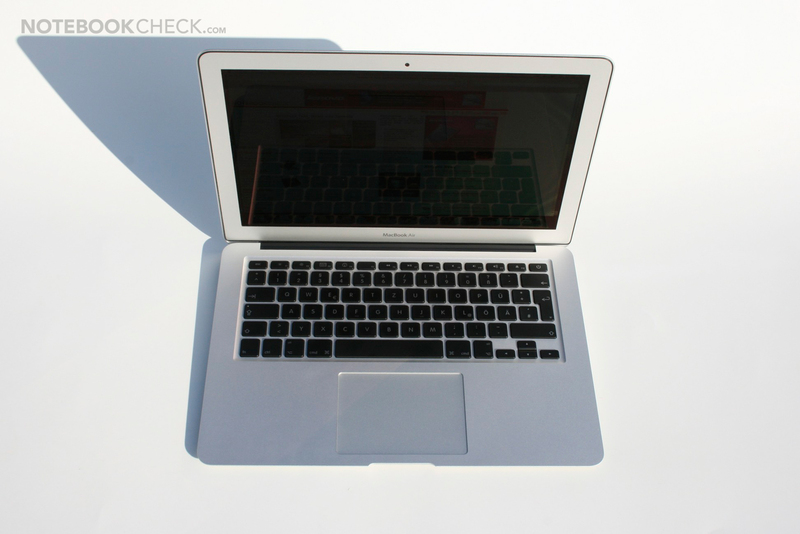 At first glance the internals of the 13" MacBook Air don't seem to show any major changes. 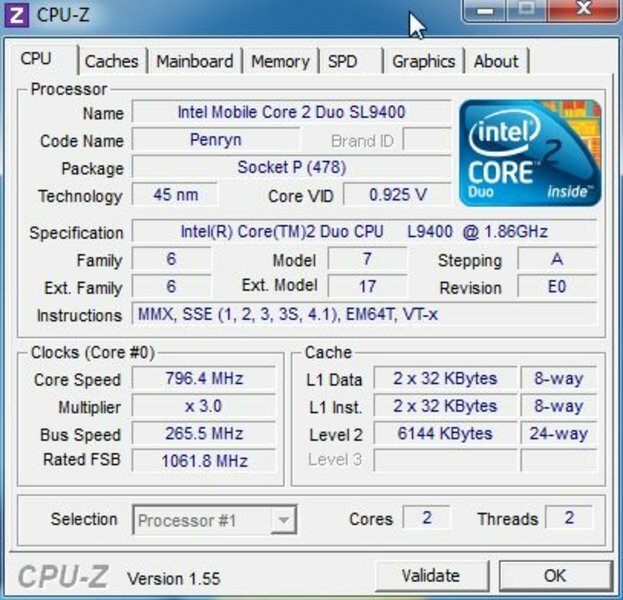 There is still a two year hold low voltage SL9400 Core 2 Duo with 1.86 GHz, and a chipset graphics card. Looking in detail does show some clear improvements though. 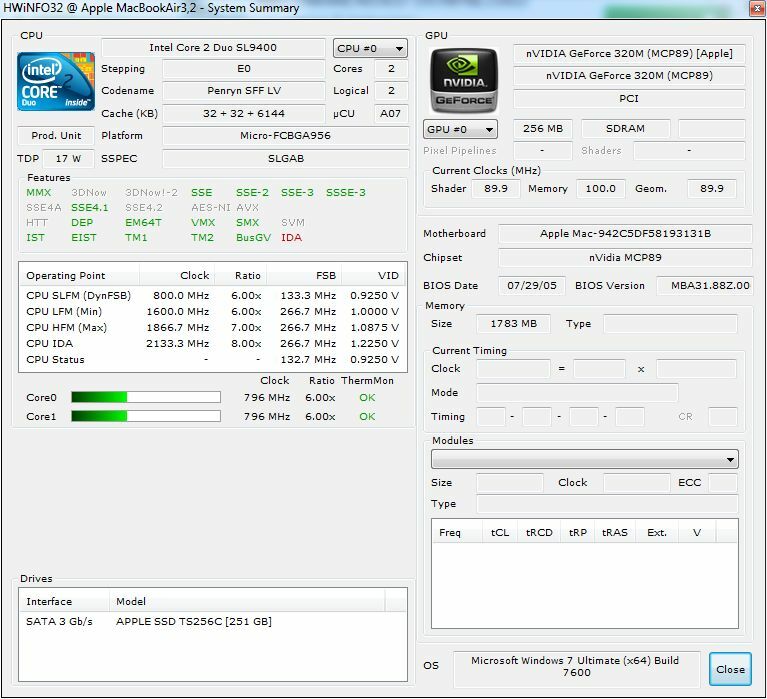 Apple has opted against the Core-i Arrandale processors, and planted the fast GeForce 320M on-board graphics card into the Air. Due to this the compact 2-chip design has been continued, resulting in a significantly improved graphics performance (particularly compared to the Intel HD graphics in the Arrandale CPUs). In addition there is now a fast SSD in all model variants. The 13" MacBook Air still has the old low voltage Core 2 Duo SL9400 with 1.86 GHz. This dual core processor which is based on the Penryn core, offers the full 6MB of level 2 cache, which provides a very good performance for the clock speed. 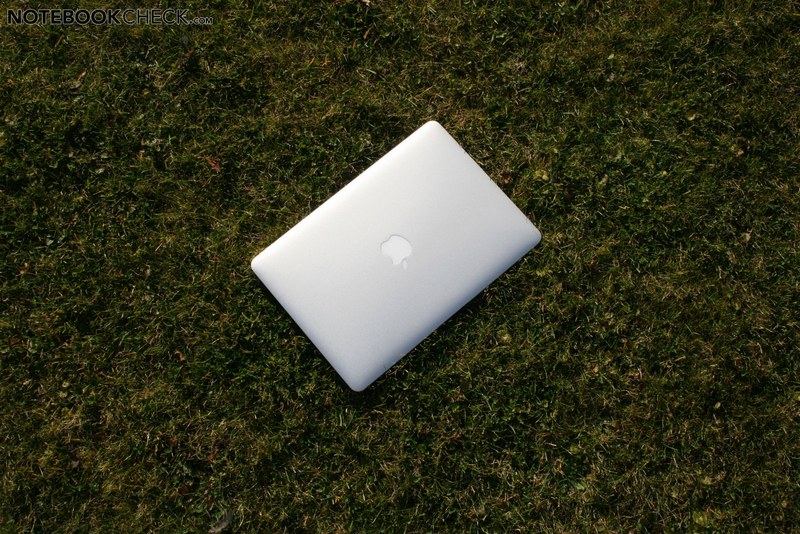 Compared to the predecessor generation of the 13" MacBook Air, the newer version can leap ahead in spite of the identical processor. 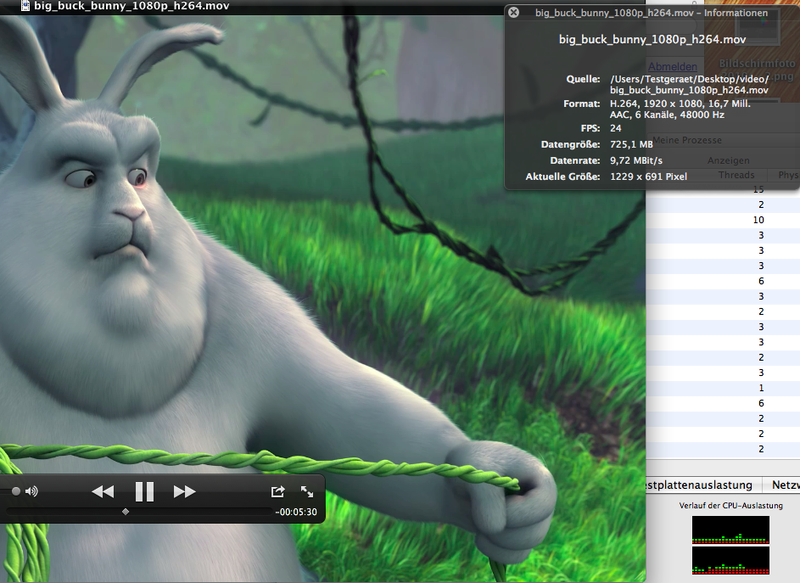 It can even leave the faster 2.16 GHz version from 2009 far behind. The simple reason for this is that the processor no longer automatically throttles itself during the benchmarks due for thermal reasons. Compared to the new Core-i UM processors, the old SL9400 can put up a good fight. The Core i3-380UM and i5-520UM processors in current Subnotebooks are more or less on the same level, with a performance spectrum between 87-112% (3DMark06 CPU, Cinebench R10, and R11.5, wPrime). The Core 2 Duo P8600 processor with 2.4 GHz in the current MacBook and 13" MacBook Pro models, can set itself apart by 20-27%. 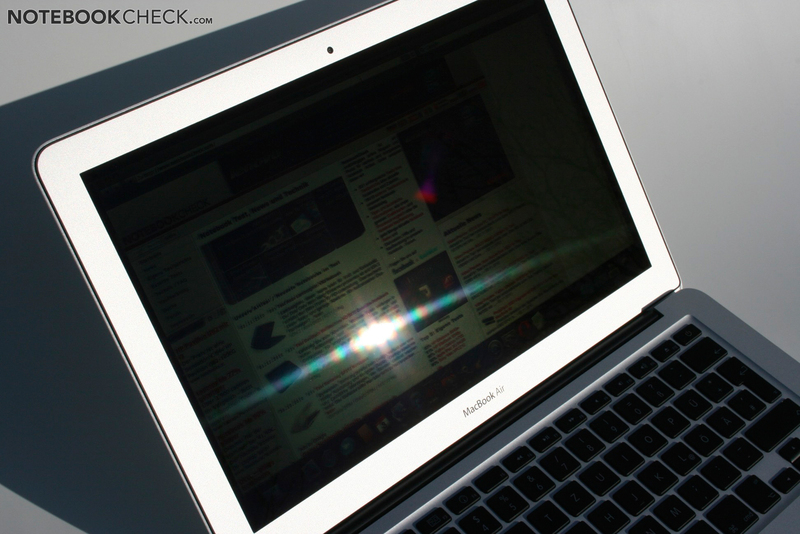 Noticeably faster are the Core i5 and i7 processors in the 15" and 17" MBP models. The i7-620M is twice as fast in many tests (3DMark06 CPU 186%, Cinebench R11.5 227%, Cinebench R10 Multi 202%, wPrime only 35% of the time). 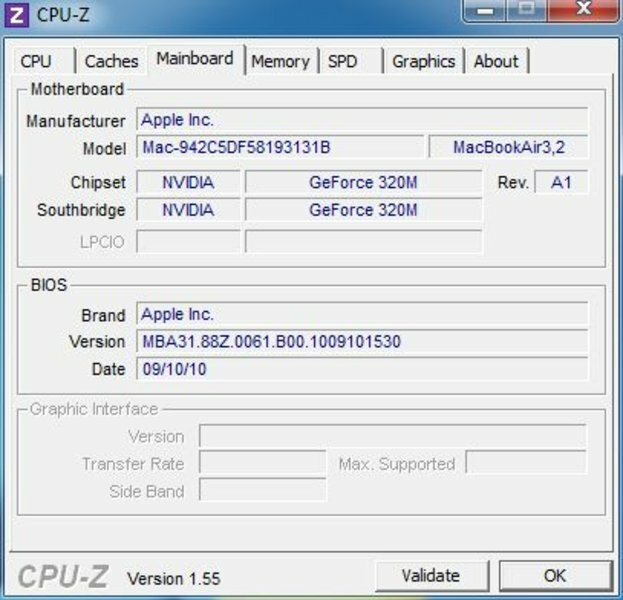 Thus the SL9400 positions itself on roughly the same level as older MacBook and MacBook Pro models with a 2.0 GHz Core 2 Duo. 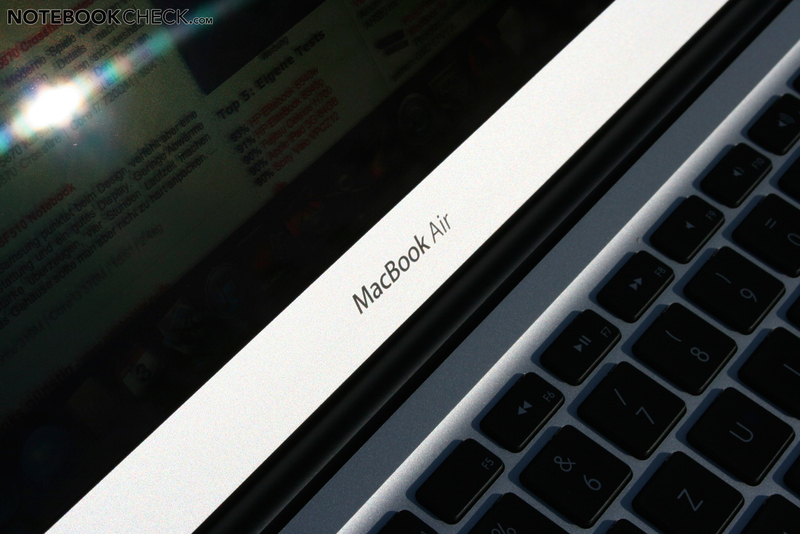 The graphics performance of the MacBook Air is surely one of its most prominent features. The integrated GeForce 320M in contrast to the bigger MacBooks was not throttled, and can thus achieve the same theoretical performance as the older dedicated mid-range graphics cards. In 3DMark Vantage GPU Score the 320M can for example position itself just above the current Mobility Radeon HD 5470, and even reach the level of the 9600M GT. 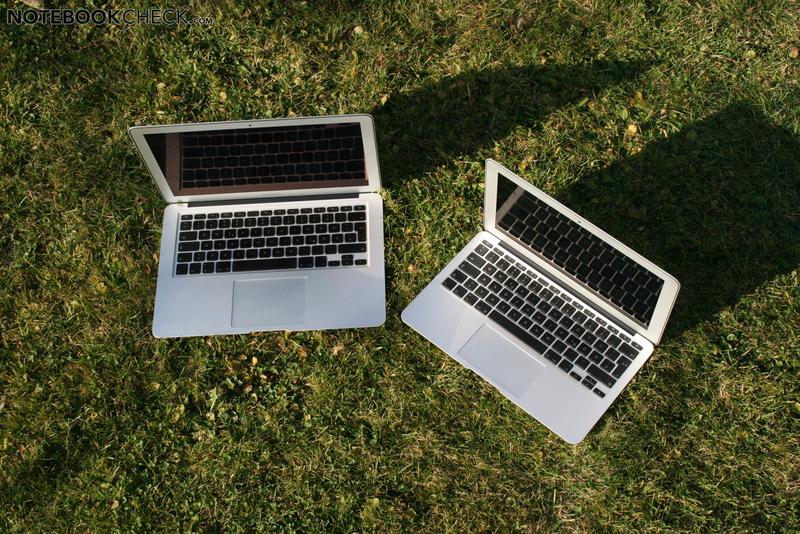 The 320M can therefore be compared to an HD 5470, which is only found in significantly bigger and heavier Notebooks. An interesting fact is that the weak CPU does not impact the results of the graphics benchmarks for the 13" model, as opposed to the 11" MacBook Air. 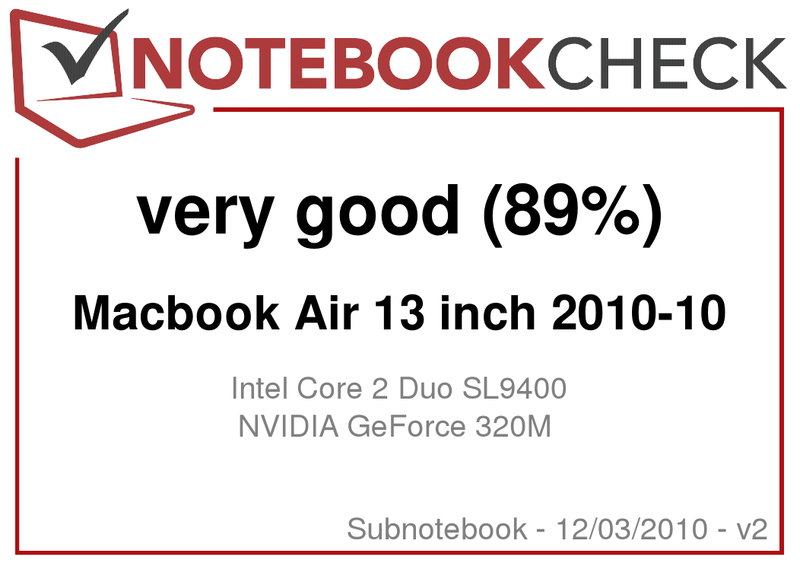 Thanks to the fast chipset graphics card and the SSD system hard drive, the 13" MacBook Air can shine in the PCMark Vantage benchmark, and even leave the 13" MacBook Pro (with normal HDD mind) behind. The smaller 11" model was 16% slower overall in the test. The MBP 15" and 17" models that are equipped with a HDD were nevertheless still 18-25% faster, depending on the CPU. 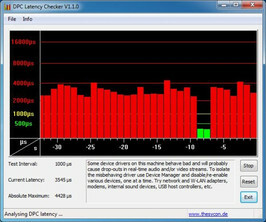 Using the Mac OS X system benchmark XBench 1.3, we checked the system performance using Mac OS X. 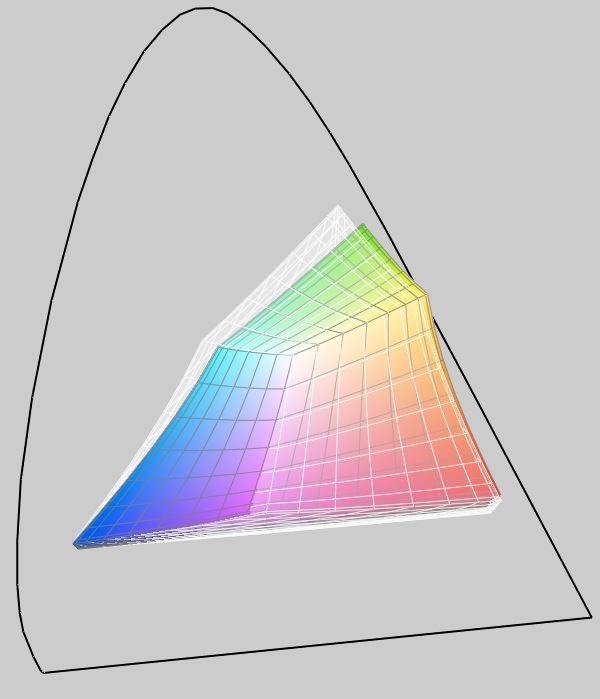 Unfortunately the results vary greatly with some sub-tests, which is why we have depicted several iterations with the same color. 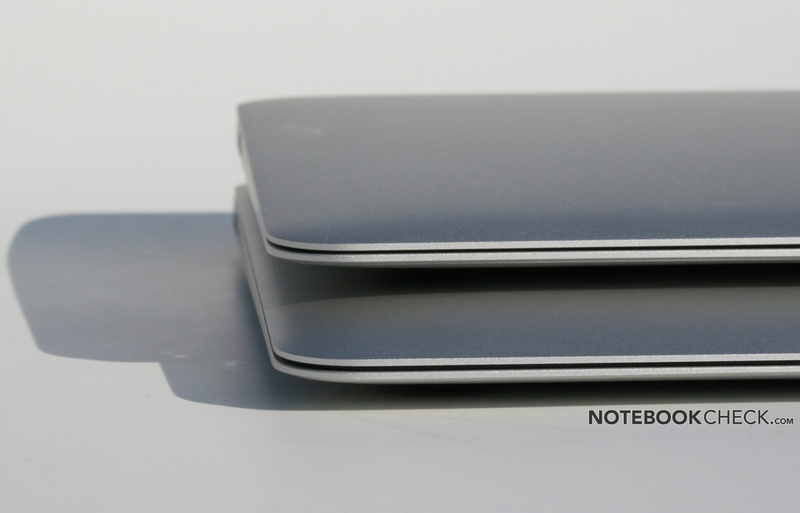 With the exception of the disc tests, the 13" model clearly performs better than the 11" MacBook Air. The faster MacBook can set itself apart by about the same amount in the CPU tests, as the 13" model can compared to the 11" model. The MacBook Pro 17" with a Core i7 processor is in another league, although it is subdued slightly in the latter tests due to the standard HDD. 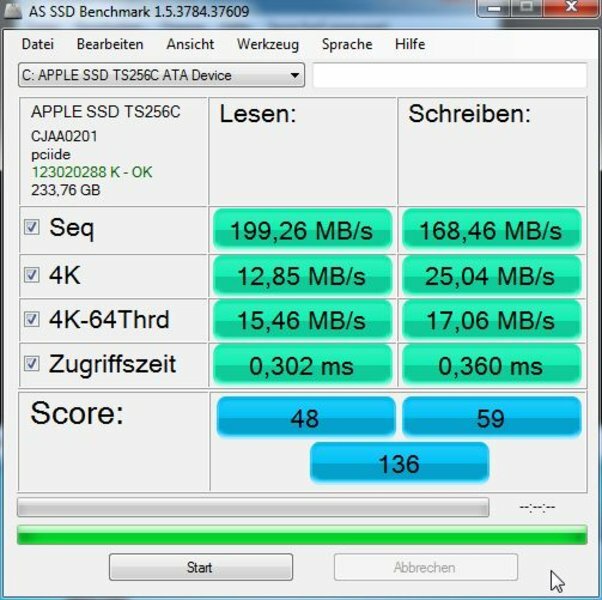 XBench 1.3 comparison - MacBook Air 1.4 GHz is clearly behind with the exception of the HDD tests thanks to the fast SSD. The Micro SATA Blade SSD manufactured by Toshiba is described by Apple as SSD TS256C (256 GB version). Toshiba itself sells the SSD as Blade X-gale THNSNC128GMDJ. As an alternative there is a upgrade kit from PhotoFast with a faster SandForce controller. The performance (mainly the read rates) of the 256 GB version was somewhat better in the test than the 128 GB version in the 11" MacBook Air. In comparison to current high-end SSDs from Intel (X25-M) or SandForce (e.g. 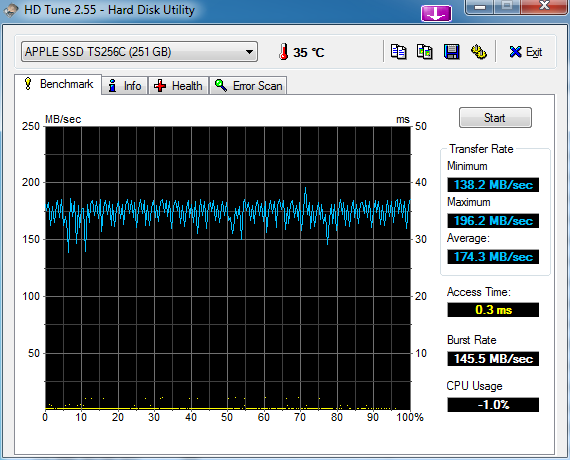 OCZ Vertex 2) the Toshiba SSD is however clearly slower. 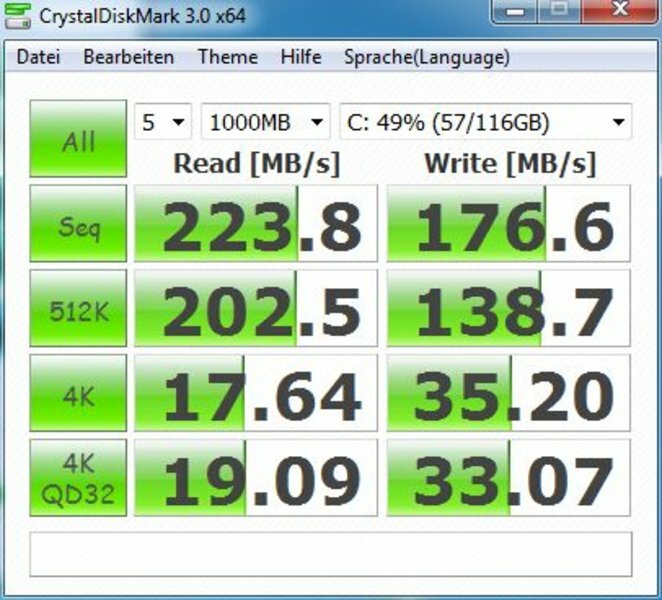 When it comes to the total score of the AS SSD benchmark for example, it is positioned on the same level as the Samsung PM800. More affordable entry level SSDs such as the Kingston SSDNow V are however still significantly slower. According to Anandtech the controller is very resilient against degrading (see SSDNov V+100 test). This is especially important, since Mac OS X still doesn't support TRIM. 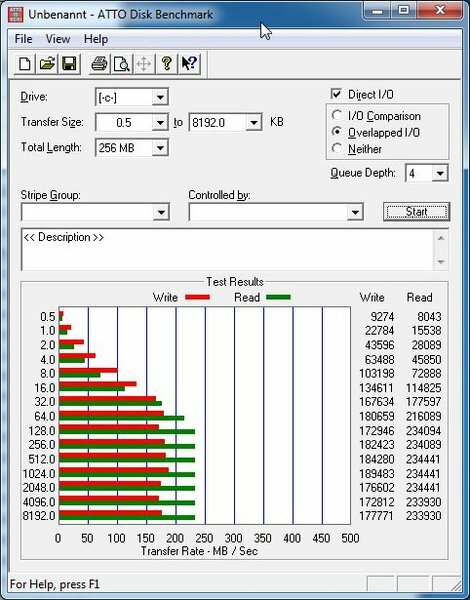 At the end of our HDTune test in Windows with the 11" MB Air, we still encountered clear performance impairments though (see screen shots). The powerful GeForce 320M chipset graphics card helps the 13" MacBook Air to achieve a considerable gaming performance. The SL9400 CPU in contrast to the SU9400 in the 11" MBAir, has much less of a detrimental effect on most games, and thus allows for smooth frame rates in most current games. Alone in Mafia 2 things got a little tight in the test despite the minimal settings. As with the 11" MB Air, the DPC latencies in Windows (per Bootcamp) are too high. Even after deactivating all sorts of possible sources of latencies (Apple Bootcamp software, WLAN, energy saving profile) we were only able to reach 1000-2000 microseconds. Thanks to the powerful CPU the 13" MacBook Air doesn't even have any problems playing back VC-1 coded HD videos in Mac OS X. In Windows 7 the graphics card can also perform this task, and thus relieve the CPU. H.264 coded MPEG4 videos are decoded by the GPU in both operating systems, and therefore hardly cause any load for the CPU. 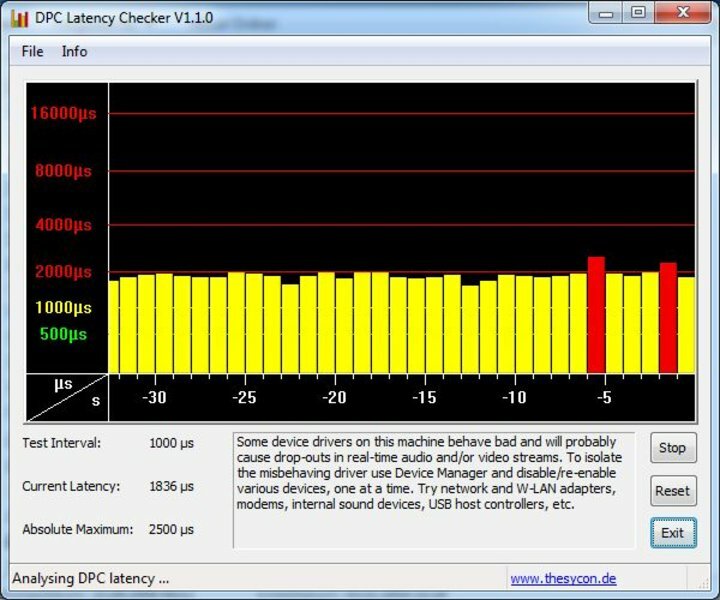 The small device does however reach its limits when it comes to streaming Flash from the internet. With YouTube videos it came to judders and dropped frames with 1080p content. 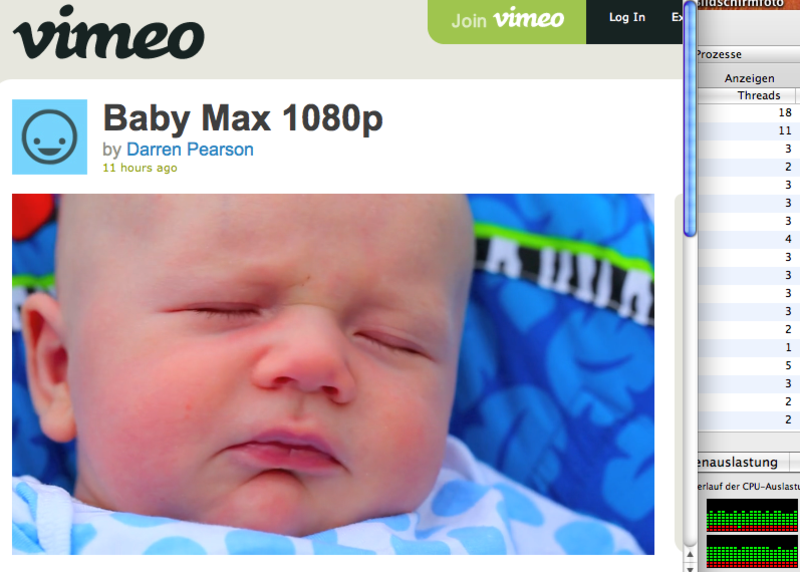 Vimeo videos were optically smoothly displayed. In Exposure Room the frame display was very intermittent (1080p), full picture noticeably less but still recognizable. 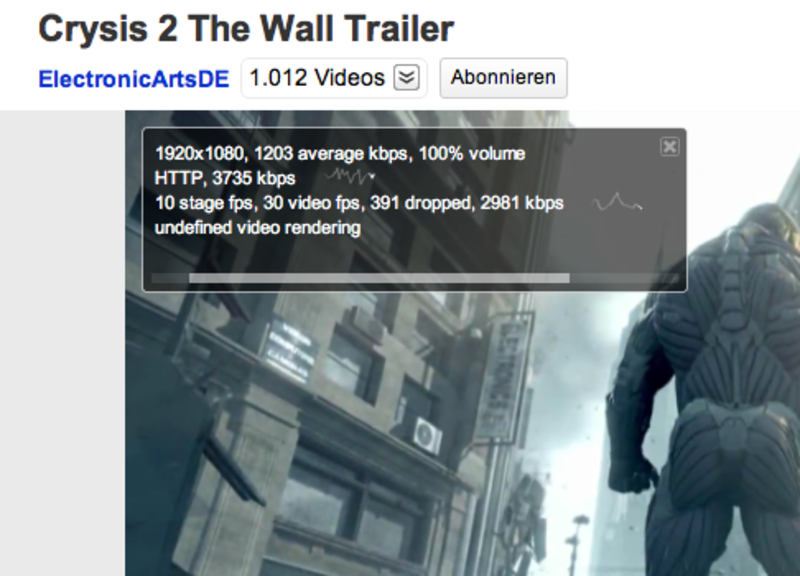 720p HD videos were playable on all platforms without any problems though. 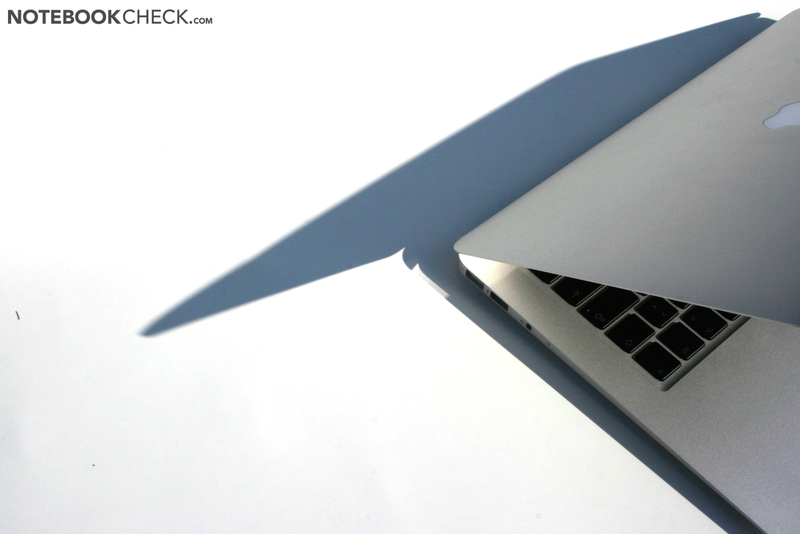 The single cooling fan in the 13" MacBook Air 2010 draws the air from behind, and also blows it back out there, as with all MacBooks. Thus the use on soft surfaces does not pose a problem for the air circulation. Due to the integrated SSD, the small fan is the only source of system noise in this slim subnotebook. In an idle state it turns with about 2000 revolutions per minute, giving a measurable 28.6 dB (ambient noises for comparison 27.6 dB). Due to a quiet high frequency hum in our tested device this was, however, still noticeable in quiet surroundings, and thus more 'hearable' than in the tested 11" device. Under a light CPU or GPU load the cooling fan turns up smoothly to about 3000-4200 RPM. 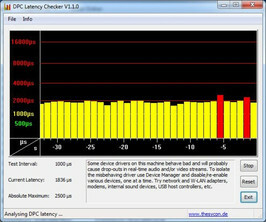 In the test this was for example the case in Mac OS X while installing StarCraft 2, and simultaneously running iTunes or while editing a video (encoding). With 30-34 dB (1.8 - 2.1 Sone) this was, however, still relatively quiet. 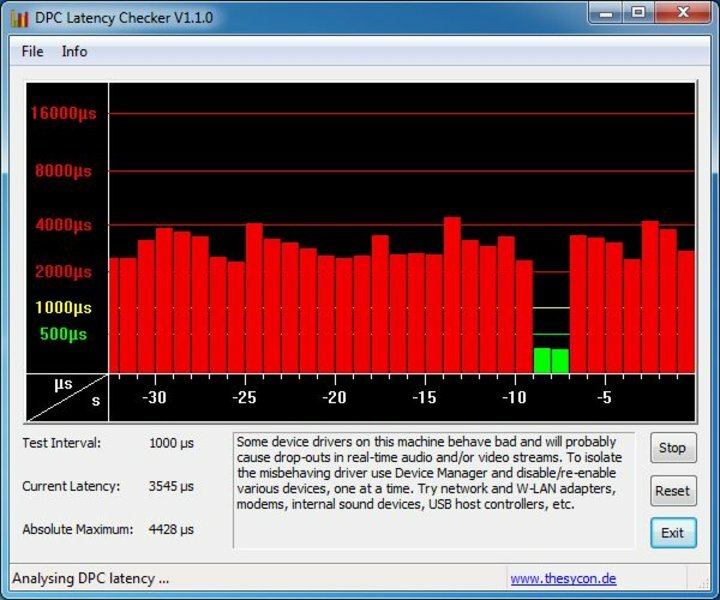 Under a higher load, such as when running 3DMark05 in Windows 7, the volume varied between 32 and 44 dB - on average about 37 dB. Frequent intensity changes depending on the level of load have to be expected. Under an extremely high load (Furmark + Prime95, or StarCraft 2 in Mac OS X), the cooling fan reaches a maximum 6000 RPM, with a corresponding 44 dB. 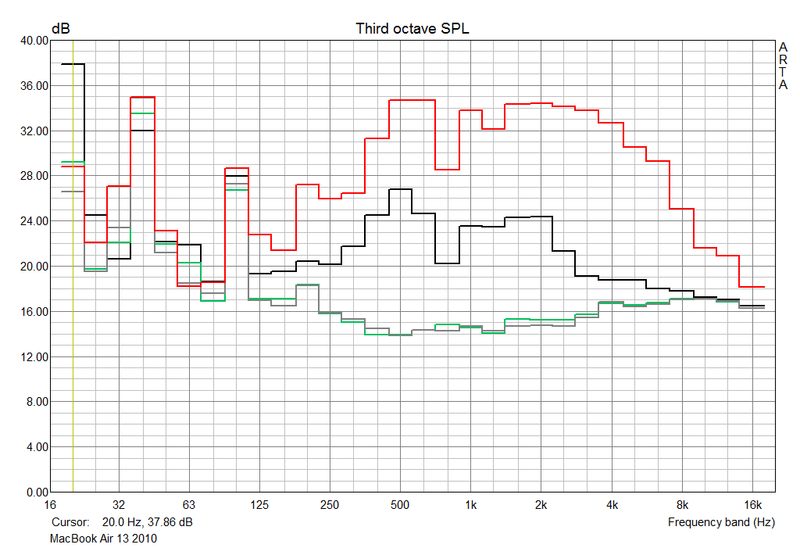 With about 4.7 Sone the MacBook is also more than twice as loud as with a light load. The system noise can then be described as a loud hissing that is not subjectively disturbing. The temperature generated by the aluminum case stays within an acceptable range, despite the quiet cooling fan. Nevertheless even without load the case shows a clear heating up on the top surface, reaching a maximum of 38°C. The surfaces that are touched (bottom surface, keyboard keys, palm resting area, trackpad) do, however, still feel relatively cool (25-33°C). After several hours of extreme load, the case reached its maximum temperatures. The palm resting area still remained relatively cool. Alone the bottom heats up noticeably for a holding area. The measured 42°C are not critical though. 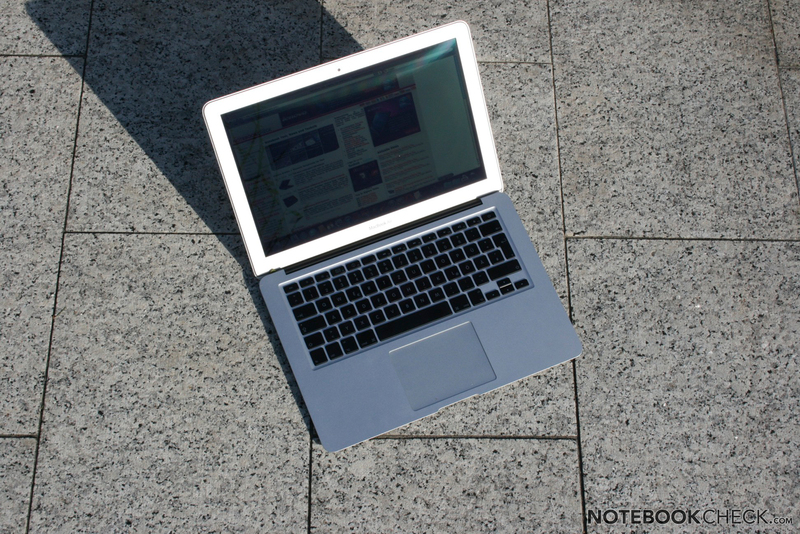 Compared to the 11" MacBook Air, the bigger 13" model stays somewhat cooler in all scenarios. The internal temperatures after our several hour extreme load test are only marginally critical on the graphics card according to the integrated sensors. This is however also exerted excessively by Furmark. The two processor cores are far from their theoretical maximum (105°C according to Intel) with 80°C. During the extreme load test we could also notice a brief throttling (slowing down of the CPU) from time to time in the Tmonitor Tool. A 3DMark05 benchmark carried immediately after the several hours stress test did, however, provide the same results as when carried out in an idle state though. The more powerful 2.13 GHz CPU could however also reach the thermal limits with normal applications, and thus not provide its full performance. As with the 11" model, Apple has integrated stereo loudspeakers into the slim case. These sound astoundingly good for their size. Nevertheless they are more suited to less demanding applications (such as internet radio or YouTube videos). 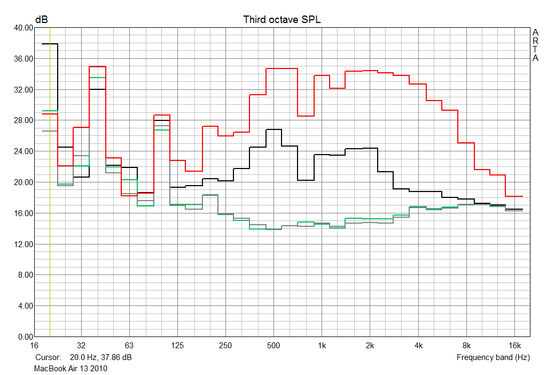 The maximum volume of 92.5 dB / 98 Sone (pink noise: 15 cm distance) is thoroughly usable, even with quiet source material. Compared to the 11" MBAir (see diagram) the 13" version is significantly louder (11" max. 87.2 dB / 67 Sone). The 13" MBAir is 46% louder with pink noise (maximum) and also has more lower frequencies. The non removable 50 Wh Lithium Polymer battery should last for up to seven hours during practical use according to Apple. Since our tests led to a range between 2-12 hours, this definitely sounds realistic. It is however only possible with less demanding applications (little Flash!) and reduced display brightness. The 'worst case' scenario of surfing the web with the maximum brightness and a lot of Flash videos, led to a battery life of 4 hours and 15 minutes in our test. Certainly formidable considering the slim build. Using Windows a significantly reduced battery life has to be expected. If the Air is running at full utilization (Battery Eater Classic), this leads to a similar 2h and 6min; without load (Battery Eater Reader) this is only 7h 28min though, and therefore 4.5 hours less than with Mac OS X. 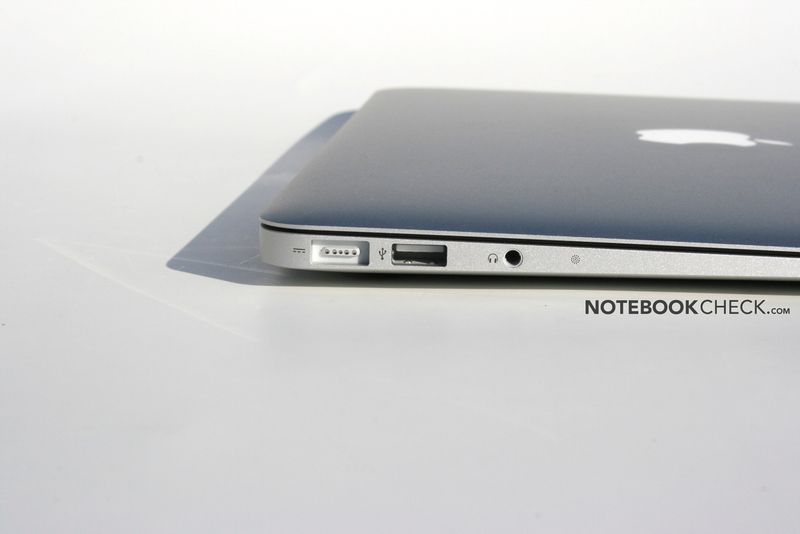 The battery was fully charged after about 2 hours and 15 minutes - without using the MacBook Air mind. Especially during our power consumption measurements the exceptionally well adapted Mac OS X can be recognized on the hardware. The minimal power consumption of 3.3 Watts has so far only been undercut by the iPad and the Toshiba AC100 with Tegra 2. Using Microsoft's operating system the measured values prove to be significantly higher in an idle state. This also explains the worse battery run times with Windows 7 and Bootcamp. 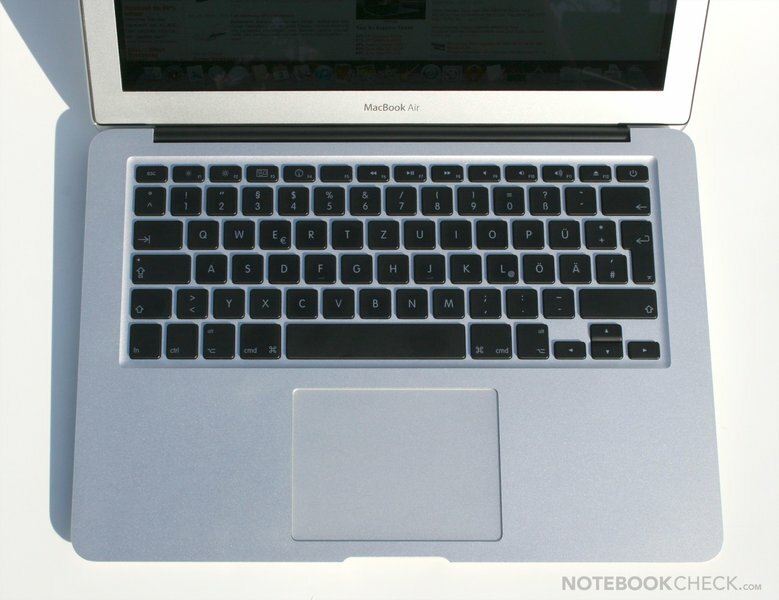 The 13" MacBook Air is a very exciting Subnotebook. The revamped unibody case leaves an excellent impression with its design, manufacturing quality, and stability despite of its very thin build. Thanks to the large high resolution 13" display, and the very good input devices, there is no need to compromise while working. 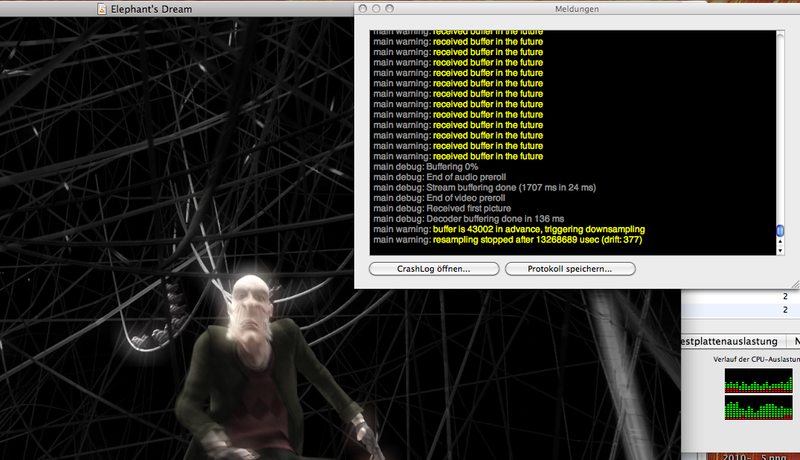 Also the performance should prove enough to satisfy most users without excessive CPU demands. Even the occasional game is possible without problems thanks to the GeForce 320M. Most Subnotebooks fail in this area. The meager measurements and weight are attainable for an expensive price, as well as the virtually non-existent and deliberately difficult upgrade possibilities. Also when it comes to the interfaces the MacBook Air is stingy, even though these have been improved significantly compared to its predecessor. In the test we were actually just wishing for a matte display surface, and normal screws to gain access to the inside of the case. Compared to the 11" MacBook Air, we were especially pleased by the better performance, longer battery life, and the larger display. We did, nevertheless, reach for the 11" device more often due to its more compact measurements. 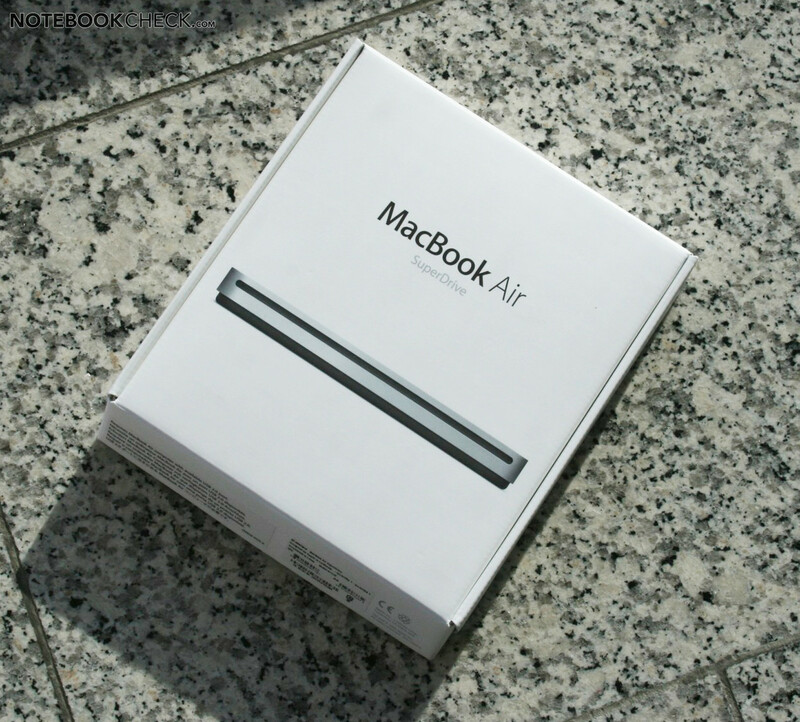 The competition for the 13" MacBook Air is obviously the 13" MacBook Pro and the 11" MacBook Air. 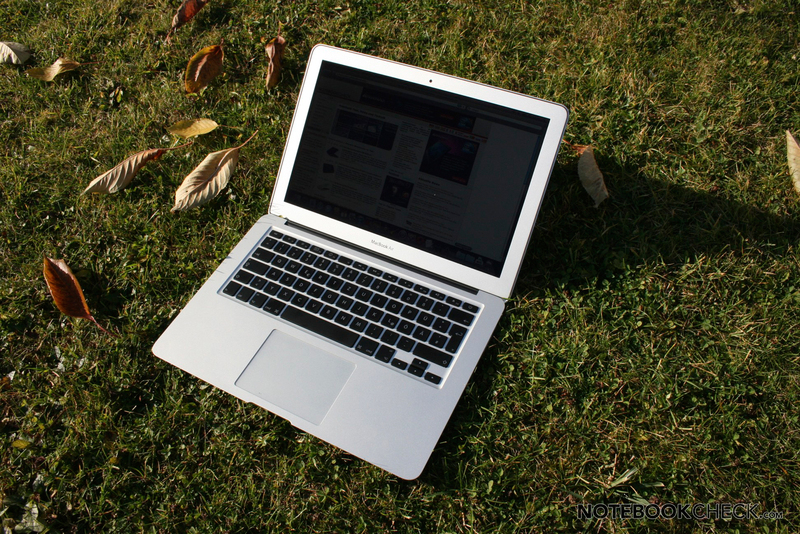 Users that are not intent on Mac OS X, could also consider the very strong Sony Vaio Z12. Somewhat less performance is provided by the similar weighing Lenovo Thinkpad X201s, or the Toshiba Protege R700. The 1.6 kg weight class would provide better performing devices such as the Acer Aspire 3820TG, or the Asus U35Jc. Special 5 star Torqx screws secure the insides. 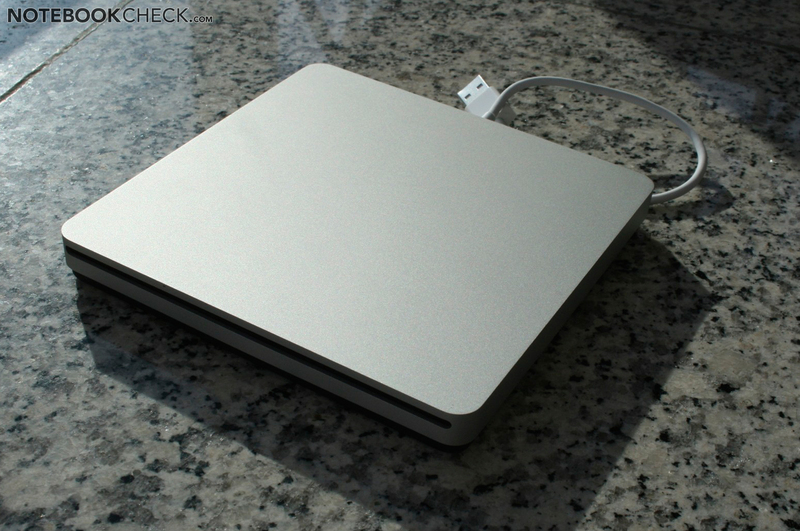 USB Superdrive for the MacBook Air. 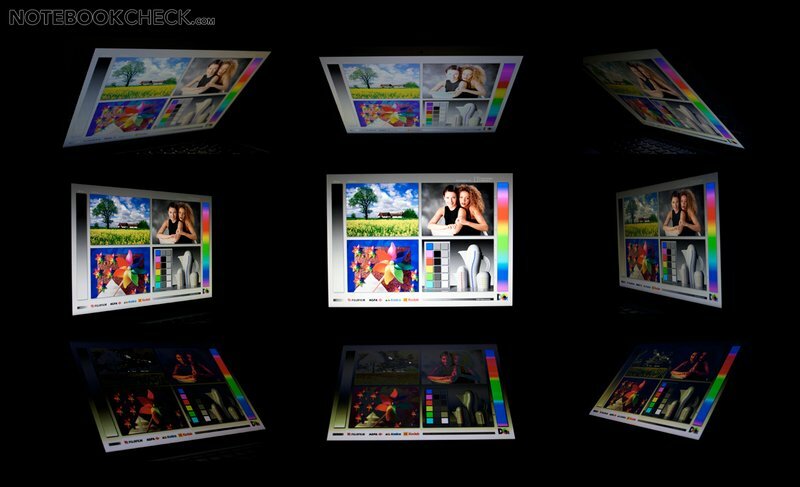 2 additional displays on the MBAir via DualHead2Go DP Edition from Matrox. The webcam is now called FaceTime Camera. 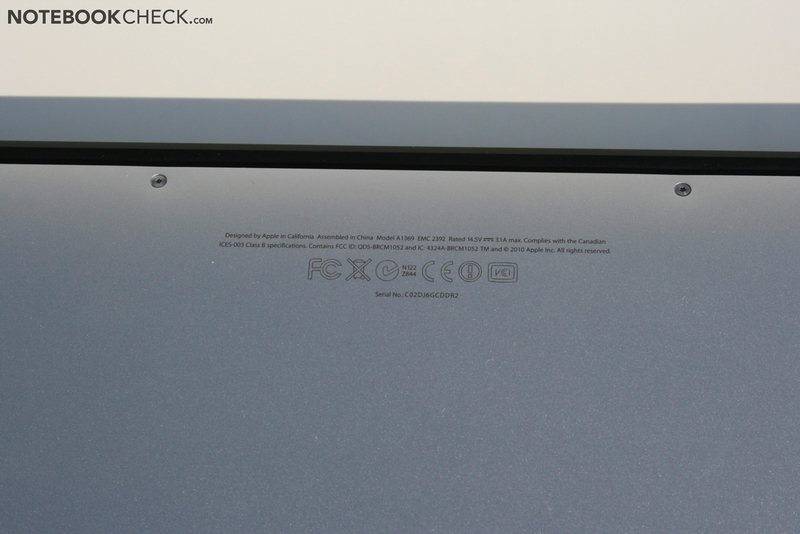 Display lid of the 17" HP Workstation (Dreamcolor 2) vs MacBook Air. The power on button has migrated to the keyboard. The reflective display is suitable for use outdoors within limits thanks to the good brightness level. Especially noticeable worse from below. Viewing angles compared to the iPad. 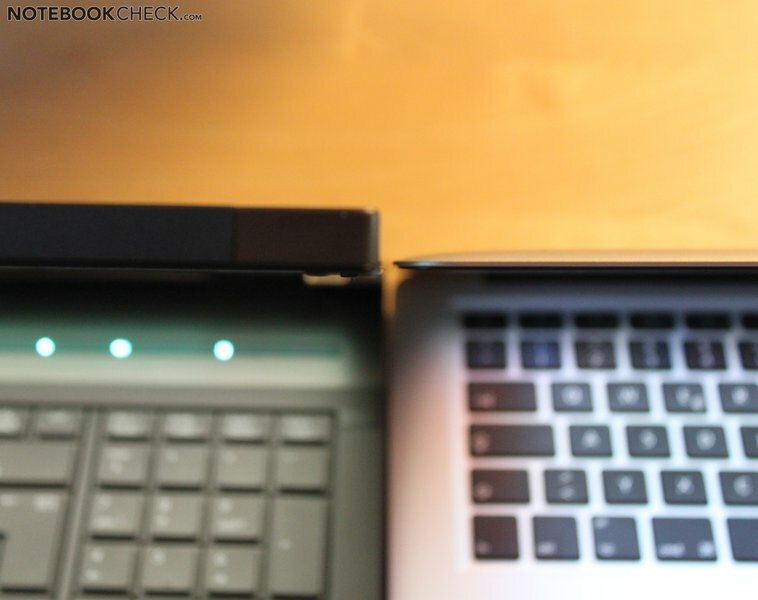 How close the 13" MacBook Air comes to the performance of a full grown Notebook, and how mobile it stays at the same time. A non reflective display, and better upgrade options. The extremely stable aluminum case despite of its thin build. The competition in the 13" Subnotebook area is definitely more abundant than compared to the 11" model. Especially the Sony Vaio Z12 with a powerful processor and graphics card is a competitor. But also the Lenovo X201s, or the Toshiba R700 are worth mentioning.